By experienced psychologist Fred Penzel, Ph.D. I have been actively involved in the treatment of OCD since 1982 and have treated over 850 cases of the disorder. During that time, I have come to many valuable understandings that I believe are important tools for anyone planning to take on this disorder. Putting together this type of list always seems arbitrary in terms of what to include, but suffice it to say, however, it is presented, there is a certain body of information that can make anyone’s attempts at recovery more effective. Some of these points may seem obvious, but it has always struck me as remarkable how little of this information my new patients, who are otherwise intelligent and informed people, are seen to possess coming into therapy. You may not like some of the things on this list, as they may not be what you wish to hear. You don’t have to like them. However, if you wish to change, you will need to accept them. The concepts of change and acceptance go hand-in-hand and define each other. There are some things you will be able to change, and some you will have to accept. It is important to discriminate between the two, so as to not end up misdirecting your efforts. This means it is like having asthma or diabetes. You can get it under control and become recovered but, at the present time, there is no cure. It is a potential that will always be there in the background, even if it is no longer affecting your life. The current thinking is that it is probably genetic in origin, and not within our current reach to treat at that level. The things you will have to do to treat it really control, and if you don’t learn to effectively make use of them throughout your life, you will run the risk of relapse. This means that if you don’t use the tools provided in cognitive/behavioral therapy or if you stop taking your medication (in most cases) you will soon find yourself hemmed in by symptoms once again. Obsessions are biochemically generated mental events that seem to resemble one’s own real thoughts, but aren’t. One of my patients used to refer to them as “My synthetic thoughts.” They are as counterfeit bills are to real ones, or as wax fruit is to real fruit. As biochemical events, they cannot simply be shut off at will. Studies in thought suppression have shown that the more you try to not think about something, the more you will end up thinking about it paradoxically. The real trick to dealing with obsessions I like to tell my patients is, “If you want to think about it less, think about it more.” Neither can you run from or avoid the fears resulting from your obsessions. Fear, too, originates in the mind, and in order to recover, it is important to accept that there is no escape. Fears must be confronted. People with OCD do not stay with the things they fear long enough to learn the truth–that is, that their fears are unjustified and that the anxiety would have gone away anyway on its own, without a compulsion or neutralizing activity. Cognitive/Behavioral Therapy (CBT) is considered to be the best form of treatment for OCD. OCD is believed to be a genetically-based problem with behavioral components, and not psychological in origin. Ordinary talk therapy will, therefore, not be of much help. Reviewing past events in your life, or trying to figure out where your parents went wrong in raising you have never been shown to relieve the symptoms of OCD. Other forms of behavioral treatment, such as relaxation training or thought-stopping (snapping a rubber band against your wrist and saying the word “Stop” to yourself when you get an obsessive thought) are likewise unhelpful. The type of behavioral therapy shown to be most effective for OCD is known as Exposure and Response Prevention (E&RP). E&RP consists of gradually confronting your fearful thoughts and situations while resisting the performing of compulsions. The goal is to stay with whatever makes you anxious so that you will develop a tolerance for the thought or the situation, and learn that, if you take no protective measures, nothing at all will happen. People with OCD do not stay long enough in feared situations to learn the truth. I try to get my patients to stay with fearful things to the point where a kind of fatigue with the subject sets in. Our goal is to wear the thought out. I tell them, “You cant be bored and scared at the same time.” Compulsions, too, are part of the system and must be eliminated for the recovery process to occur. There are two things that tend to sustain compulsions. One is that by doing them, the sufferer is only further convinced of the reality of their obsessions, and is then driven to do more compulsions. The other is that habit also keeps some people doing compulsions, sometimes long after the point of doing them is forgotten. The cognitive component of CBT teaches you to question the probability of your fears actually coming true (always very low or practically nil), and to challenge their underlying logic (always irrational and sometimes even bizarre). It is human nature to always want quick, easy, and simple solutions to life’s problems. While everyone with OCD would like there to be a magical medicinal bullet to take away their symptoms, there really is no such thing at this time. Meds are not the “perfect” treatment; however, they are a “pretty good” treatment. Generally speaking, if you can get a reduction in your symptoms of from 60 to 70 percent, it is considered a good result. Of course, there are always those few who can say that their symptoms were completely relieved by a particular drug. They are the exception rather than the rule. People are always asking me, “What is the best drug for OCD?” My answer is, “The one that works best for you.” I have a saying about meds: “Everything works for somebody, but nothing works for everybody.” Just because a particular drug worked for someone you know, does not mean that it will work for you. Relying solely on meds most likely means that all your symptoms will not be relieved and that you will always be vulnerable to a substantial relapse if you discontinue them. Discontinuation studies (where those who have only had meds agreed to give them up) have demonstrated extremely high rates of relapse. This is because drugs are not a cure, but are rather a control. Even where they are working well, when you stop taking them, your chemistry will soon revert (usually within a few weeks) to its former unhealthy state. Meds are extremely useful as part of a comprehensive treatment together with CBT. They should, in fact, be regarded as a tool to help you to do therapy. They give you an edge by reducing levels of obsession and anxiety. While those with mild OCD can frequently recover without the use of meds, the majority of sufferers will need them in order to be successful. One unfortunate problem with meds is the stigma attached to them. Having to use them does not mean that you are weaker than others, only that this is what your particular chemistry requires for you to be successful. You cant always fight your own brain chemistry unaided. Using psychiatric drugs also does not mean that you are “crazy.” People with OCD are not crazy, delusional, or disoriented. When relieved of their symptoms, they are just as functional as anyone. In using your intuition to deal with what obsessions may be telling you, there is one thing you can always count on: it will always lead you in the wrong direction. It is only natural to want to escape or avoid that which makes you fearful. It’s instinctive. It really amazes me how common this is. This may be fine when faced by a vicious dog or an angry mugger but, since the fear in OCD results from recurring thoughts inside your head, it cannot be escaped from. The momentary escape from fear that compulsions give fools people into relying upon them. While compulsions start out as a solution, they soon become the main problem itself as they begin taking over your life. People with OCD never stay with what they fear long enough to find out that what they fear isn’t true. Only by doing the opposite of what instinct tells you will you be able to find this out. How long does it take? As long as is necessary for a given individual. Speaking from experience, I would say that the average uncomplicated case of OCD takes from about six to twelve months to be successfully completed. If symptoms are severe, if the person works at a slow pace, or if other problems are also present, it can take longer. Also, some people need to work on the rehabilitation of their lives after the OCD is brought under control. 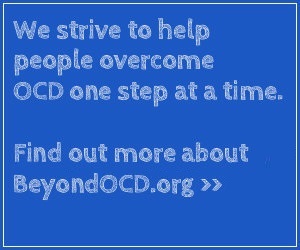 Long-term OCD can take a heavy toll on a persons ability to live. It may have been a long time since they have socialized, held a job, or doing everyday household chores, etc. Some people have never done these things. Returning to these activities may add to the time it takes to finish treatment. However long it takes, it is crucial to see the process through to the finish. There is no such thing as being “partially recovered.” Those who believe they can take on only those symptoms they feel comfortable facing soon find themselves back at square one. Untreated symptoms have a way of expanding to fill the space left by those that have been relieved. When explaining this to my patients, I liken it to getting surgery for cancer. I ask them, “Would you want the surgeon to remove it all, or leave some of it behind?” Or, put another way, it is not a game you can simply drop out of midway with your winnings and expect to keep them. It has always been a favorite saying of mine that, “Getting well is 50 percent of the job, and staying well is the other 50 percent.” We have actually come full-circle back to Point #1, which tells us that OCD is chronic. This tells us that although there is no cure, you can successfully recover and live a life no different from other people. Once a person gets to the point of recovery, there are several things that must be observed if they are to stay that way. As mentioned in Point #7, the goal of proper therapy is to teach people to become their own therapists. It gives them the tools to accomplish this. One of these tools is the knowledge that feared situations can no longer be avoided. The overall operating principle is that obsessions must therefore always be confronted immediately, and all compulsions must be resisted. When people are seen to relapse, it is usually because they avoided an obsessive fear which then got out of hand because they went on to perform compulsions. Another cause can be an individual believing that they were cured and stopping their medication without telling anyone. Unfortunately, the brain doesn’t repair itself while on medications, and so when drugs are withdrawn, the chemistry reverts to its former dysfunctional state. Finally, some people may have fully completed their treatment, but have neglected to tell their therapist about all of their symptoms, or else they did not go as far as they needed to in confronting and overcoming the things they did work on. In pursuing treatment for OCD, it is vital to go the distance in tackling all of your symptoms, so as to be prepared for whatever you may encounter in the future. It is vital to remember that no one is perfect, nor can anyone recover perfectly. Even in well-maintained recoveries, people can occasionally slip up and forget what they are supposed to be doing. Luckily, there is always another chance to re-expose yourself and so, rather than a person beating themselves up and putting themselves down, they can soon regain their balance if they immediately get back on track by turning again and facing that which is feared, and then not doing compulsions.